Cristina’s Cart is making fans out on Hull Street. Plus, RVA Beer Week and more. 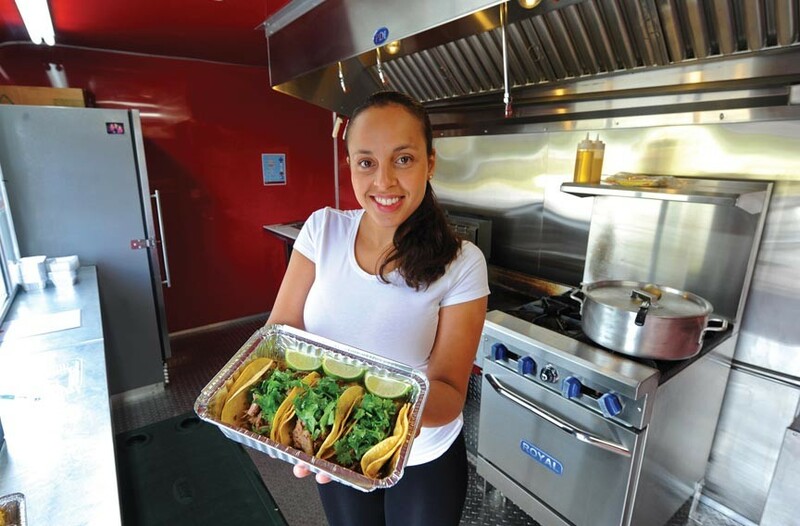 Cristina Kaiser serves carnitas tacos and other meaty specialties from her food cart in Midlothian. It turns out one of the city’s best food trucks isn’t in the city at all, but out Hull Street Road in Midlothian. Open since August, Cristina’s Cart is the custom commissary-on-wheels of Cristina Kaiser, a 27-year-old who’s rapidly growing a fan base for succulent and meaty parking-lot lunches. She serves flat pressed sandwiches, carnitas tacos, chicken and ground beef empanadas, jibarito sliders, and the dish of pernil — roasted pork — and Spanish rice or plantains. Everything’s cooked to order in the red and stainless steel kitchen trailer, which was fabricated in Miami. With two fryers, a steam table, flat griddle, full range and oven, refrigerator, hood and four sinks, it’s a sparkling departure from some of the area’s less-equipped and often road-worn food conveyances. Her family recipes, tweaked from her father’s restaurant collection, “have a Caribbean flavor, very different from Mexican food,” Kaiser says. Using cilantro, peppers, onions, garlic, achiote oil, yucca and slow-roasted meats, she offers “flavorful, but not spicy” food and a signature hot sauce, yomemato, which she’s planning to bottle. Specials such as chicken fricassee and winter soups add variety, and she expects to remain open year-round. Cristina’s Cart is parked in the Steel Horse Harley Davidson lot at 11501 Hull Street Road from Tuesday through Saturday, 11 a.m.-3 p.m. facebook.com/cristinascart. Suds city: RVA Beer Week is Nov. 1-10, which is more than a week, but the calendar’s packed with ways to celebrate the rise of hops here. With 10 local breweries, a recent tripling of draft beer lines devoted to craft brews in local restaurants, and a steady increase in beer sales, knowledge and interest, Richmond is positioned as a beer capital of the region. Beeristoric, a tour led by historians, is Nov. 10, and makes seven stops at local breweries and watering holes. Tickets are $45 and sold at Center of the Universe and Strangeways breweries. A detailed schedule of events is online at tastethelocal.com. Friends of food: A five-course tasting menu at Heritage celebrates the release of “Maximum Flavor: Recipes That Will Change the Way You Cook” from Aki Kamozawa and Alex Talbot of Ideas in Food. Talbot joins his longtime friend chef Joe Sparatta on Nov. 11 for the dinner, which also features chef Lee Gregory and bartender T. Leggett, both of the Roosevelt. Tickets are $75 and include a signed copy of the book. Reserve at 353-4060. 1627 W. Main St. heritagerva.com. Toothy grin: The newest entry into Richmond’s street fair scene, the Boulevard Pumpkin Festival, was a smash hit Oct. 26. With bands, beer, and pumpkin-forward foodstuffs from 20 vendors, the crisp fall day drew thousands. Popkin Tavern’s pumpkin crème brûlée, Fat Dragon’s fried pumpkin dumplings, Savory Grain’s pork and pumpkin sliders and a pumpkin with chocolate dessert from Mosaic were standouts among dozens of creative concoctions from RVA chefs. NOW CLOSED: Moshi Moshi closed over the weekend in Carytown. Chef Kevin LaCivita will open Pomegranate in the space at 3321 W. Cary St. this winter.